Earlier this year while I was completing an online family history unit, through the University of Tasmania, I found my Grandfather's family on a second passenger list, and thought it strange that the family was listed on two manifests a month apart. I thought that maybe someone in the family had gotten sick or something like that and their journey had been postponed as a result. ”This list is cancelled in consequence of the voyage being abandoned after vessel sustained damage whilst in collision with the S. S. “Patella” on the 13th ult. All the passengers were relanded at Newhaven”. 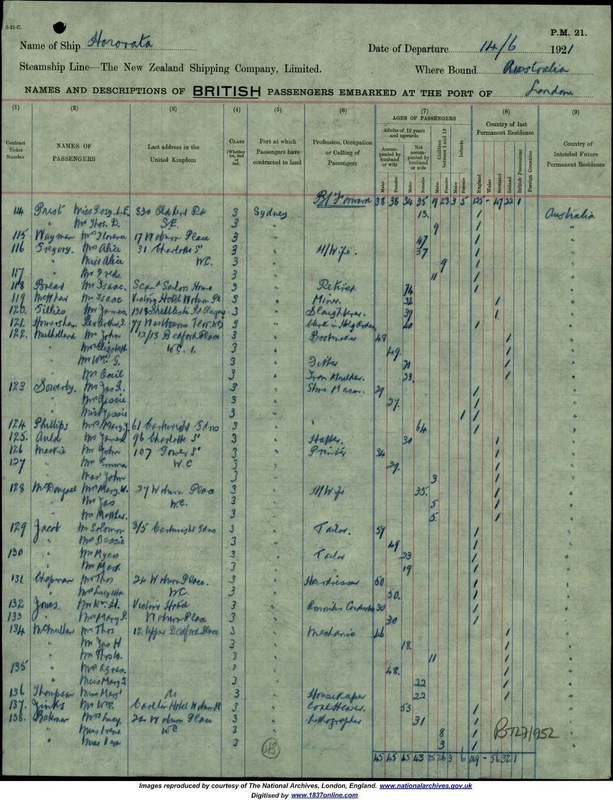 This is an example of where it is essential to scroll through online images in a series for a multi-page document or record such as a shipping manifest to check the first or cover page of such a list or manifest. 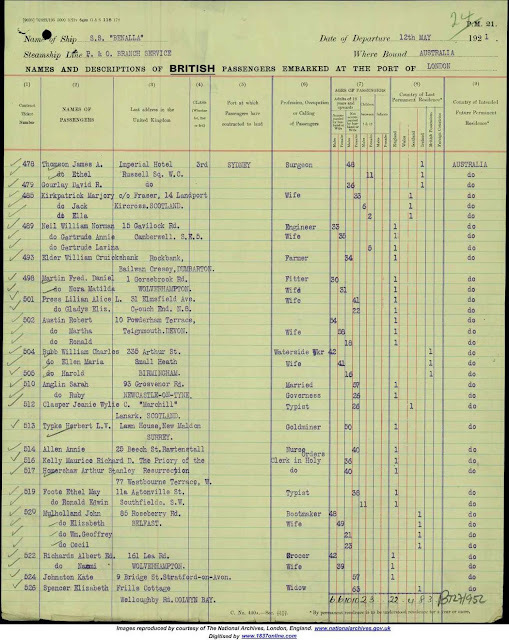 This page contained crucial information regarding this voyage, and explained why my Grandfather's family had returned to London and then boarded a different ship bound for Sydney, Australia a month later. Liner Beached After Collision LONDON, May 13.-The Peninsula and Oriental liner Benalla, from London to Sydney. Australia, with 1,100 passengers and seamen on board, has been beached near the Royal Sovereign Lightship, close to the entrance to the Straits of Dover, following a collision with the British tank steamship Patella, says a Lloyds wireless dispatch from North Foreland. The collision occurred in a fog. No one was injured. Six hundred of the passengers have been taken off. Messrs. George Wills and Co., Ltd., have received advice by cable that the steamer Benalla's passengers are proceeding to Australia in the following steamers:- Osterley, left London May 25; Paparoa, left London May 25; Beltana, left London May 26; Mantua, leaves London June 4; Hororata, leaves London June 11. I was staying in London recently and walking towards a friend's hotel a few weeks ago and noticed the name of a street "Bedford Place", I remembered the name from the shipping list and it was like it was fate that I should see it, so I went and took some photos. 12/13 Bedford Place, London, WC1, this is where my Great Grandparents, John & Elizabeth Mulholland, Grandfather, Joseph Cecil Mulholland, and Grand Uncle, William Geoffrey Mulholland stayed in London prior to migrating to Australia in May/June 1921. They were on board the Ship, S.S. Benalla, when the ship was involved in a collision with S.S. Patella on 13 May 1921. Francis, Duke of Bedford, statue facing Bedford Place, London. (1). 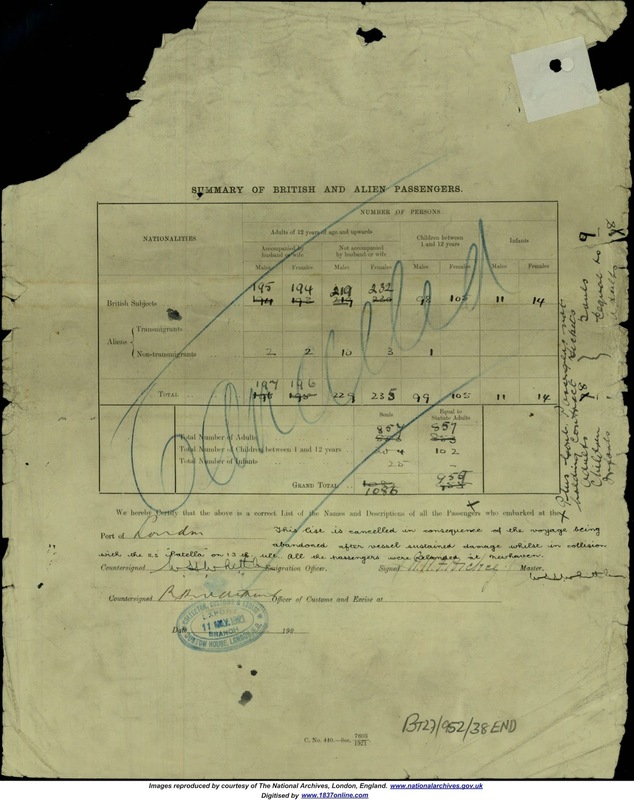 The National Archives, U.K.. "Passenger Lists Leaving the U.K. 1890-1960", database, brightsolid online publishing ltd, find my past (http://www.findmypast.co.uk : accessed 04 February 2015), manifest S.S. Benalla, London, England to Sydney, Australia, departing12 May 1921, TNA_BT27_0952_00_0016_P_0024F, John MULHOLLAND; citing The National Archives microfilm publication TNA_BT27_0952_00_0016_P_0024F. (2). 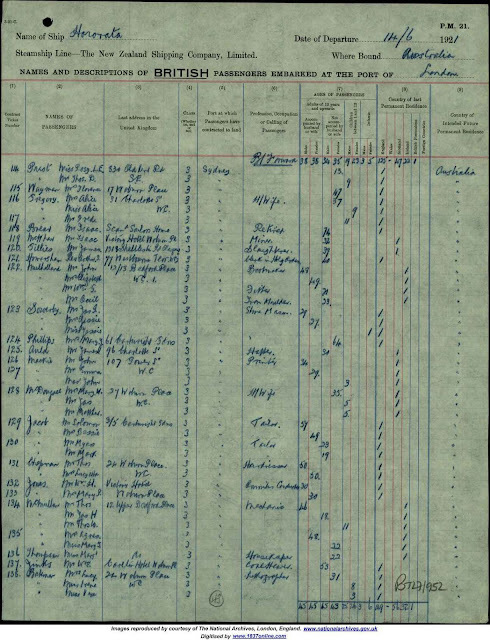 The National Archives, U.K.. "Passenger Lists Leaving the U.K. 1890-1960", database, brightsolid online publishing ltd, find my past (http://www.findmypast.co.uk : accessed 04 February 2015), manifest S.S. Hororata, London, England to Sydney, Australia, departing 14 June 1921, TNA_BT27_0952_00_0041_P_0006F, John MULHOLLAND; citing The National Archives microfilm publication TNA_BT27_0952_00_0041_P_0006F. (3). The National Archives, U.K.. "Passenger Lists Leaving the U.K. 1890-1960", database, brightsolid online publishing ltd, find my past (http://www.findmypast.co.uk : accessed 04 February 2015), manifest S.S. Benalla, London, England to Sydney, Australia, departing12 May 1921, TNA_BT27_0952_00_0016_P_0024F; citing The National Archives microfilm publication TNA_BT27_0952_00_0016_P_0024F. (4). [Anonymous], "Liner Beached After Collision", New-York Tribune, (New York, New York, USA), 14 May 1921, online archives (http://chroniclingamerica.loc.gov/lccn/sn83030214/1921-05-14/ed-1/seq-19/ : accessed 06 February 2015), p.19, col. 5-6. (5). [Anonymous], "Benalla in Collision During Fog in Channel", Barrier Miner, (Broken Hill, New South Wales, Australia), 14 May 1921, online archives (http://trove.nla.gov.au/ndp/del/article/45556893 : accessed 07 February 2015), p. 1, col. 4. (6). [Anonymous], "Benalla's Passengers", The Sydney Morning Herald, (Sydney, New South Wales, Australia), 4 June 1921, online archives (http://trove.nla.gov.au/ndp/del/article/15943843 : Accessed: 07 February 2015), p. 15, col. 7.